Some changes have been made to WWE Universal Champion Brock Lesnar's schedule. As you might expect, WWE Universal Champion Brock Lesnar isn’t scheduled for any dates with the company anytime soon. He’s not being advertised for WWE’s Elimination Chamber pay-per-view (PPV) next week. 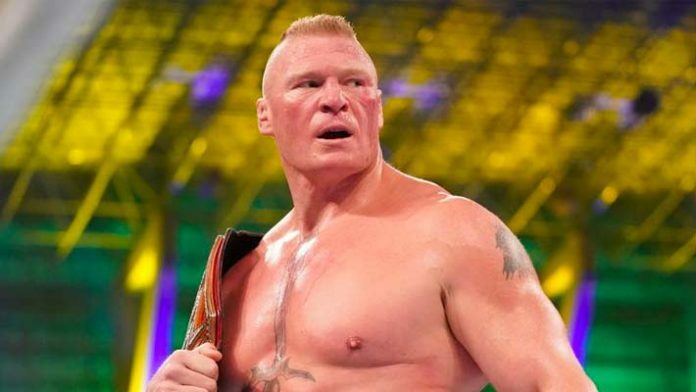 Lesnar is neither scheduled for Monday’s episode of RAW or WWE Fastlane, the final WWE PPV before WrestleMania 35. “The Beast” was initially scheduled for the post-Elimination Chamber episode of Monday Night RAW on February 18th. He was also advertised for Monday Night RAW the following week in Atlanta, Georgia on February 25th. However, WWE has since removed Lesnar from those dates. As of this writing, Lesnar is only being advertised for the March 18th episode of Monday Night RAW from the Allstate Arena in Chicago, Illinois. This is the only pre-WrestleMania show Lesnar is currently advertised for. Of course, this could all change at any time. It should be noted that Lesnar didn’t compete at either Elimination Chamber or Fastlane last year either. Of course, Fastlane was a SmackDown single-brand PPV last year, meaning Lesnar wasn’t supposed to work it anyway. Lesnar’s last match took place at the Royal Rumble last month when he successfully defended his Universal Title against Finn Balor. Now, he’s expected to defend his throne yet again, this time at WrestleMania 35 against 2019 Royal Rumble winner Seth Rollins. WrestleMania 35 goes down from MetLife Stadium in East Rutherford, New Jersey on April 7, 2019. What do you think of Lesnar’s WWE schedule as it currently stands?